Hello Neopians! 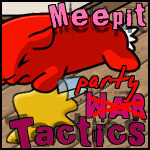 You're reading (live) coverage of the mass-frenzy attack on the Neopian Times headquarters. I'm Scenette, your local Neopian reporter since 2007. I'll be keeping you informed of strange happenings around the area as they happen! As issue number 300 of the Neopian Times approaches, widespread chaos is breaking out across Neopia. Don't be alarmed, however; your favourite Neopian Times White Weewoo is safe in the hands of Dr Frank Sloth, who kindly offered to take the Weewoo under his wing (excuse the pun) for a few days while the commotion settles down. We are adamant that the star of the Neopian Times will be in good care while editors battle it out back at the headquarters. In the last few days, several hundred entries have flooded into the building and battered editors. They are swimming in a rainbow pool of comics and stories, full of random nonsense, which are ready to be scrapped - the waste bins are already choking with the increase of reject entries. Several editors have been called into the local Meepit Asylum through the urgent panic to finish publishing in time for issue 300 - you can tell how crazy it is around here now. Crowds have been gathering around the HQ for days with their supplies of bottled water and chocolate goodies, keeping the Chocolate Shop owner insanely busy - he has reported over 5,000 items selling in just one day! The Chia Police are issuing temporary accommodation in the form of tents, generously supplied by the Toy Shop for an undisclosed amount, to those who are trying to hand in their entries, and volunteers have opted to help secure the site and keep the situation under control, but are so far unsuccessful. Security is very tight here at the moment, and Neopians have been limited to one entry each to ensure that everyone has a fair chance. Dozens of editors are running wild as attempts to get through all entries are miserably failing, and they only pile up as the minutes go on. The tally of editors taken ill due to this fiasco has rocketed in the past two weeks, and it's only set to rise. Being a few editors short, the pressure is really mounting. They decline to comment on the current situation, but a heartfelt message of love goes out to all those guys up there who are trying their hardest to produce a fabulous issue for all Neopians to read. Chaos will erupt unless this issue is finished on time. Worried Neopians and their Neopets are currently gathering outside the doors to wish editors good luck on the deadline, but they fear that is all they can do in the run up to the milestone issue. We can only hope that those editors will be able to finish this issue and still be in one piece after. After all, the editorial won't be the same if there are bits of editors hanging off every sentence, and it wouldn't be an editorial without the added humour and silly questions. Two hundred letters have just been hurled at the window of the headquarters by the local mail delivery, shattering the exterior glass panels. This is shocking as they normally have such a good reputation when delivering. Editors are reportedly standing upon their desks, terrified of being submerged by paper. I'm speaking, live, to a delivery Neopian who talks about this terrible situation and the measures they've had to take when delivering to the headquarters. Jerry, what do you think of the chaos that has recently erupted at the Neopian Times headquarters that we all know and love? Jerry says: "Well, it truly is amazing; I've not seen anythin' like it to be honest. There must 'ave been an increase in the amount of neomail goin' to this place by at leas' 500% - it truly is a massive jump and there's only more to be delivered as Neopians gain extra creative motivation in the run up to the issue. We've been instructed to cram them letters in at all costs - whether it be through th' window, letterbox, door or even the lil' petpet entrance in the back door. I seen delivery Neopians run off their bicycles 'cause of the rush to get entries in... they even lost their hats! It's dead upsettin' for a postie, ya know... don't understand why it's such a big deal but I do love me a bit o' editorial on the early morning Sunday mail run... Anyway, over to you, Scenette." That was just one insight into the situation here at the headquarters. As you can tell, it's very serious and tempers are running high; the slightest hitch will completely snap the editors and the issue will blatantly not go ahead as schedule is as tight as it could possibly be. It's like rubber bands being stretched to the maximum, so to speak. Although, please note, our Neopian Times editors are not rubber bands. Please. Do. Not. Stretch. The. Editors. They're not elasticated. Thank you. Views of the Times are expected to double, as the issue tries to cram in as many articles, comics, stories and continued series' as possible - more to read for addicted Neopets and owners alike. They're hoping for a deluxe edition that will keep them entertained for more than just a week. Fellow Neopian user, aidan_hood, comments on the catastrophe up at the headquarters and his current views of the situation. Aidan_hood, over to you. Aidan_hood says: "I walked past the Neopian Times HQ what must have been over a week ago, and tents had already been set up, with eager writers and avatar collectors camping out days in advance, desperate to get their articles and comics to the top of what was expected to be a very large pile! And when I came out of the neohome today, all I wanted was a packet of Cheesy Neos. But no, the food shop had already sold out, and I get myself stuck in this crowd! The streets have gone crazy, come alive even. Uncontrollable hoards of Neopians have taken over Neopia Central, climbing over one another, articles in hand, to reach the last minute deadline! I'll be staying in when Issue 350 gets released if it's like this again! Neopia has officially gone mad!" Hello there, what do you think of the recent trauma at the Neopian Times HQ? These crowds are out to hand in their articles for the 300th Issue of the Neopian Times, before the deadline which is so far unconfirmed. Veteran: “What, what’s this? Has Jeran come to town? Ooh, is he signing autographs?! No? Oh. Oh, 300 is it? I remember back from the start! In fact, I’ve still got an antique copy of the third issue somewhere in my Neohome. It’s very, very rare, don’t you know! I... Oh, it's a bit busy, isn't it? I've never seen this place so busy before! The young 'uns don't care 'bout this place no more, it's all for the avatars... Look at this mess! There's litter everywhere! You scruffs oughta be punished! Why, in my day..."
Live coverage will resume shortly. Reporter has been knocked unconscious by a large wad of incoming comics. Stay tuned. Announcement from Dr Frank Sloth. Bow down to your master, fools! Resumed coverage resumes in 5, 4, 3, 2, 1... And we're back on air! Hello Neopians, we're sorry for the brief interruption. As you will have noticed, it's the early hours of the morning and Neopian Times Issue 300 is about to go live as we speak. You can just imagine the tension here right now. We're going to hand you over to Neopian Times editor, Sandy McEdit. Sandy, what was the pressure like the last few weeks? Sandy McEdit: "You have no idea, Scenette! If you thought what you saw on the streets of Neopia was bad, try the HQ! We were completely run off our feet, checking and re-checking everything was perfect for the issue 300. We also had to make sure that people got their prizes, confirmation/rejection neomails and it was just crazy stuff. Really, really crazy. A few editors had to be sent to the Meepit Asylum - we just couldn't hang onto them in the state they were in; it wouldn't have been fair. They're taking a well-deserved rest - as are the rest of us! - and should be back within the next week. Meanwhile, we're hoping for a good turnout on views - at least double the usual amount - that would really be fantastic." Thank you for your input, Sandy; we hope the editors are feeling better and ready to edit once again in the near future. The release of Neopian Times Issue 300! No sooner than we said it... the doors have just this moment opened and everyone is desperately trying to cram into the entrance to get their hands on the Neopian Times! I can see younger Neopets almost being trampled on as a crowd of people has turned into a stampede... the Defenders are desperately trying to keep the crowd under control... Oh! Already we have screams of joy and also tears. We're going to go and speak to some of these Neopians. Upset avatar collector: "*Sniffles* I've been rejected at Issue 200, 250 and now 300! I'll do whatever it takes to add that avatar to my collection! *bursts into tears, then dries eyes* I worked so hard on my entries, only for it to be worth nothing!" Joyous Neopian Times writer: "I'm completely ecstatic that my comic has been chosen to feature in the Issue 300! That's my eighth one now, it's great to be able to feature in the Issue 300 because it's such a mile stone. I do feel bad for all those who were rejected, though, and I hope they're more successful next time." Disappointed reader: "I'm not sure that the editors have selected the best entries... I mean, I saw some previews from Neopian Times writers and thought their entries were far better than some I have seen. Good job to those who have great entries, though; you're in the minority." Aspiring young Neopian writer: "Wow, I'm gobsmacked! I actually can't believe I've made it! After days, weeks, months of worrying that I wouldn't make the cut, my effort has been appreciated! This is the first time I've ever made it into the Neopian Times and it was fantastic to see my name on the list of stories! I can't wait to start writing again and publish my second story! I spat out my Orange Juice when I saw my name in the list, the poor Techo next to me got a bit of a splash! Thank you, editors!" Neopian Times reader: "This issue is absolutely fantastic, the editors did a good job on choosing great entries! Congratulations to them all - I'm going to have a busy week reading all of these and I honestly couldn't be happier because they all seem to great! A big pat on the back for everyone who was published, and good luck to them with future publications! I'm looking forward to Issue 350 - I can already tell it's going to be smashing!" So, a somewhat mixed feeling about this issue it seems. On the whole, it appears that most are impressed with the standard and quality emerging and of course, it's only the small hours so there are many, many more people who will be coming to read the issue and check if their attempt at entering has been successful. Most people are still tucked up in bed, dreaming of counting Babaas' in Maths Nightmare, so naturally they won't be up and about just yet. We're going to say a big congratulations to everyone who made it: your effort has paid off! To those who didn't quite make it, well, there are more chances coming up so don't fret! Your time will come soon! We hope everyone enjoys Issue 300! This is scenette, reporting from Neopia Central on the Neopian Times Issue 300. Over and out!